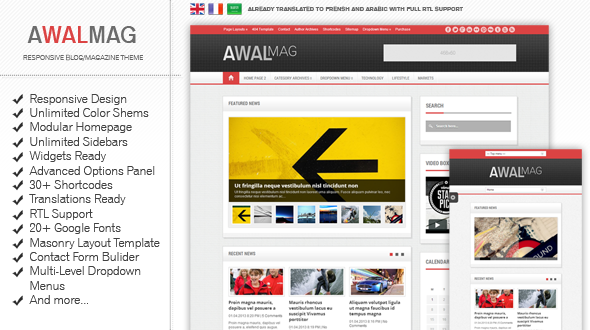 Awalmag, is a responsive wordpress theme, for blogs and magazines, easy to setup and manage with a rich theme options panel. The theme is highly customisable with unlimited color schemes and widgets ready. With the modular home page system you can build unlimited home blocks fully configurable. The theme is translations ready ,support RTL languages, and already translated to french and arabic. Thank you for purchasing my theme, if you want some support contact me via email at the moment. I want to show ads in the Sidebar ? I want to show ads in the header ? I don\'t want to show related posts in single post page ? I don\'t want to show featured image in the top of the article ? I want to activate google analytics in the theme ? How Can i change the footer copyrights text ? How to disable breadcrumps ? To show ads in the sidebar, go to appearance -> widgets -> add the advertisement widget to your sidebar. To show ads in the header, go to the theme options panel -> Header ads management, you will find some options to control the header ads. To hide related posts block in single post page, go to the theme options panel -> single post settings -> you will find the option \"Show related posts\", select \"No\" if you want to hide the related posts. To hide featured image in the single post article go to edit post panel, you will find a box named \"Hide Featured Image\" just below \"Set Featured Image\" Box, Check the box if you don\'t want to display featured image on the post. To activate Google analitycs, copy the google analytics tracking code and go to the theme options panel -> Google analytics -> paste the code in the textarea and save changes. 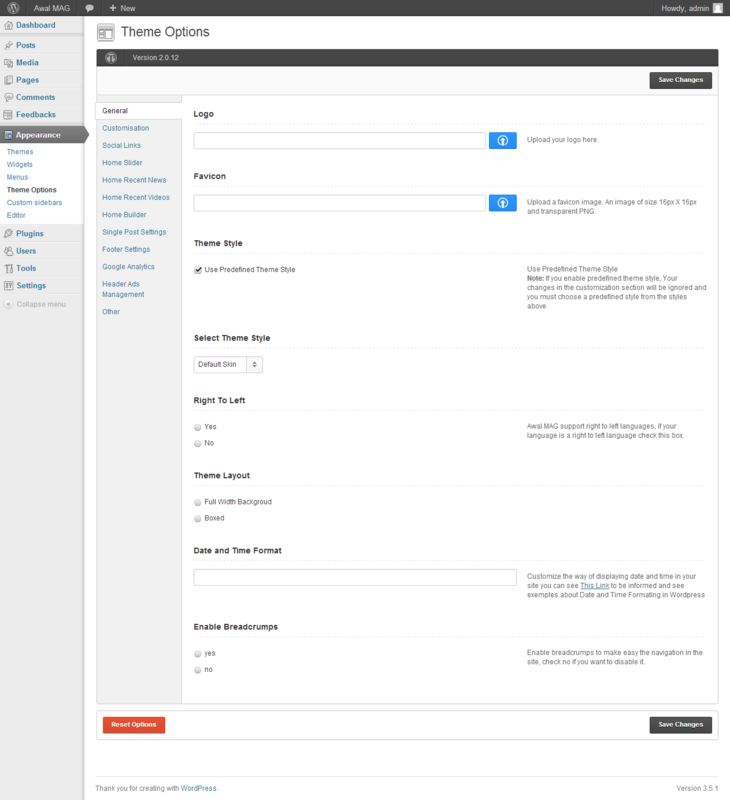 go the theme options panel -> Footer settings -> you will find \"Custom Copyrights\" option, fill the field by your own copyrights text. Go the theme options panel -> General -> you will find \"Enable Breadcrumps\" option, select no if you want to disable it. To change date formatting go the theme options panel -> General -> you will find an \"Date Format\" option, fill the field by your desired formatting.